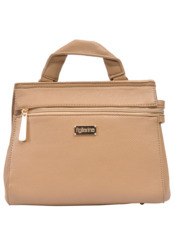 Store all your day-to-day essentials in elegant style with this Shoulder Bag from Figliarina. Crafted in a classy neutral hue, it features a spacious main compartment for an ultra-chic and practical option on hectic days. Carry yours to punctuate your work to weekend ensembles.